at 135 cr market cap and ent value of 332 cr the company does a sale of 900-1000 crores a PAT of 24-25 crores. The company has been increasing capacity over the years. An EBIDTA of 55 cr makes it pretty interesting in times to come. Last quarter results were encouraging. Worth a look will dig deeper. Anyone tracking the company ? This was one co which I picked up in very early double digits during 2004 or 05 and soon Mudhu Kela (rel cap or some fund had entered) and stock became a multibagger quickly However, something didn’t seem working and all and I got out somewhere in midway. In hindsight, I was lucky to have got out as despite so many years, the stock is probably at the same price. I think we must use such stocks as a case study to understand the reason behind the under-performance. 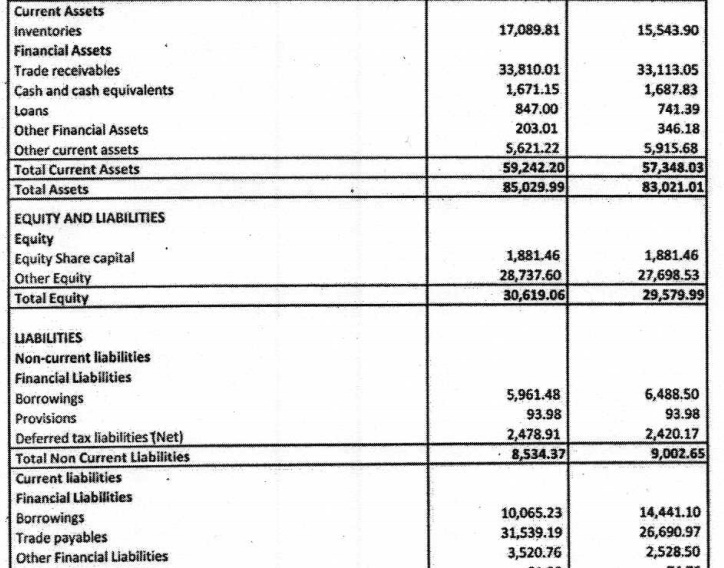 Had a quick glance at nos and I think it may be due to frequent equity structure changes? PS: Haven’t tracked the stock in recent times and it may be throwing some opportunity. I came across this on one of my screens couple of weeks back. 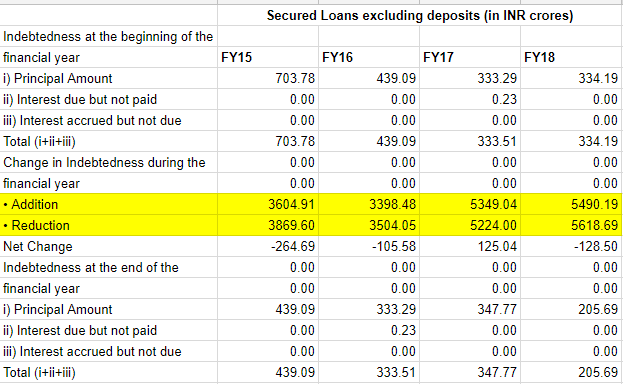 There has also been deleveraging with reducing debt levels as captured in the above Cash Flow statement and below balance sheet. KIL, incorporated in 1985, was promoted by Late D.C. Surana and Mr. Narrindra Suranna, son of Shri D. C. Surana, in Kolkata. In 1985, the company established a unit in Daman for the manufacture of poly vinyl chloride (PVC) compounds. Sustained expansion over the next decades has resulted in diverse product portfolio consisting of PE compounds, PVC compounds, master batches, engineering plastics, reprocessed compounds. The company has seven manufacturing plants situated in West Bengal, Daman & Diu, Dadra & Nagar Haveli and Noida with an aggregate installed capacity of 2,96,700 MTPA. 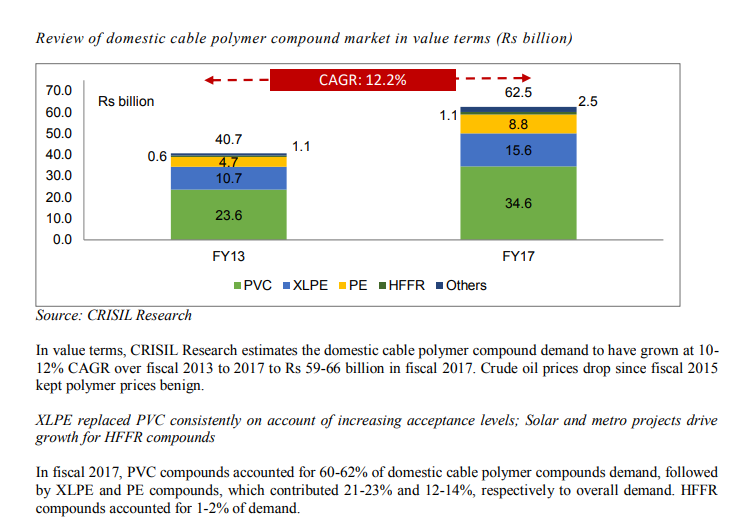 The largest amongst this is PE compounds (comprising 54% of sales) with strong market leadership in sub segments such as Sioplas (market share of 50%), XLPE (market share 33%) and Semicon (market share 25%). The company earns around 15% of its revenue from exports to more than 24 countries, which are LC backed with majority of the payments having tenure of 60-90 days. Further, the company also imports its raw material requirements from Middle East, Japan, Malaysia, Indonesia, Thailand etc. on similar payment mechanism i.e. LC backed with majority of the payments also having tenure of 60-90 days. However the imports hold a bigger pie as 30-40% of the raw material requirement is imported; providing natural hedging to an extent. The company also regularly hedge its forex exposure, however, the timing difference between payment and export proceeds, exposes the company to volatility in foreign exchange. The major raw materials required are PVC resin, LLDPE and LDPE contributing to almost 65% of total raw material cost. The price of LLDPE/LDPE and PVC are linked to crude oil prices which are volatile in nature. The operating profitability of the company has been lower in the range of 4-4.5% during the last three years. Company procures around 70% of its total raw material requirements from Reliance Industries Limited, Indian Oil Corporation Limited and ONGC Petro-additions Limited, leading to lower bargaining power with suppliers. 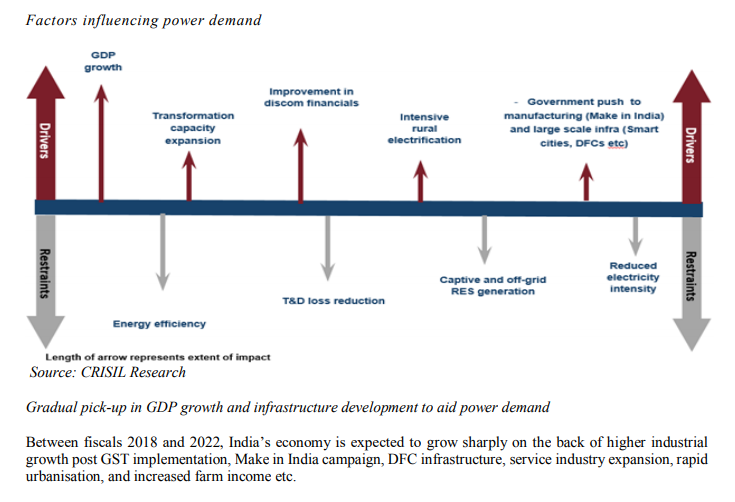 Irrespective of which government comes in, the focus will be on transmission and evacuation infrastructure of the RE plants which are expected to be commissioned over next 3 years implying potential tailwinds for solar/wind cables at the minimum. 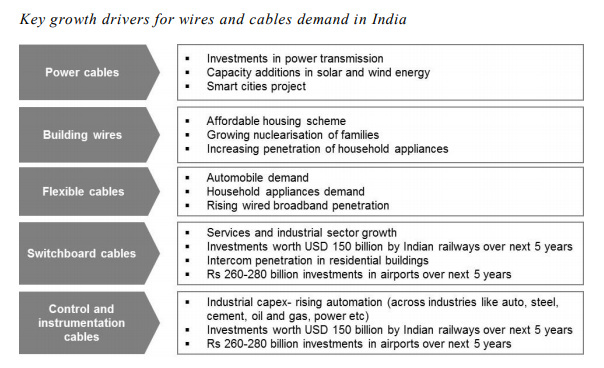 Both Apar and KEI have posted good numbers with respect to the cables segment. 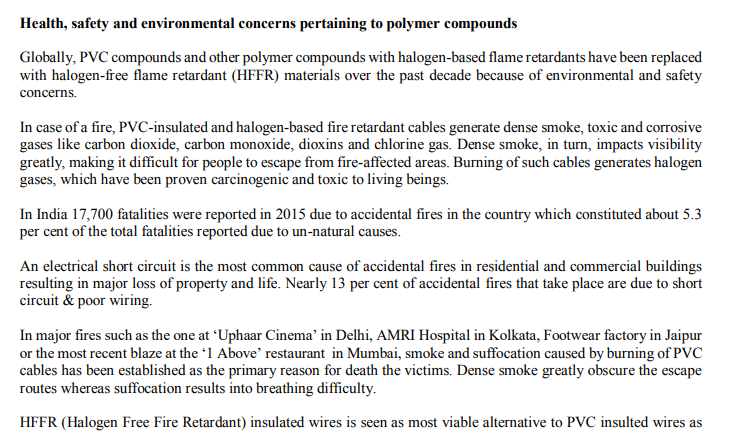 Introduction of stricter BIS regulations related to HFFR - Halogen Free Fire Retardant which is more REACH and RoHS compliant. 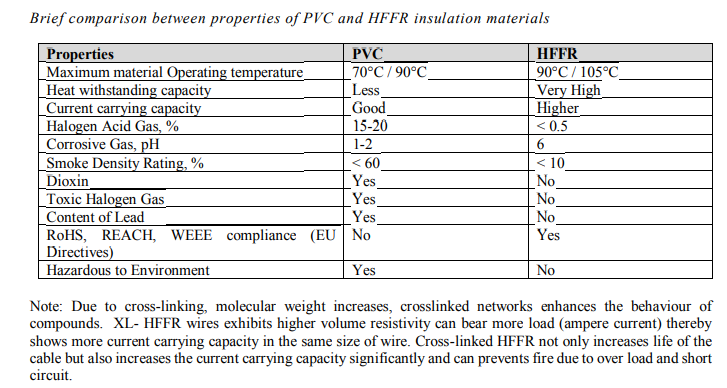 Increasing focus on HV and EHV power cables. Over and above the promoter holding, there is additional 13% held by entities indirectly linked to Promoter (Will be uploading the tofler network snaps in later posts). This gives rise to a non-significant likelihood of possible pump and dump in future though they do not seem to have engaged in frequent bulk/block deals and seem to be genuine long term holdings which get swapped every few years. All 3 previous acquisitions were made through share swap and thus the equity dilution alluded to by @ayushmit back in 2013. On August 8, 2017, SEBI had classified a list of 331 ‘suspected shell companies’ on the basis of MCA’s recommendation, which included KIL, and restricted their trading on the stock exchange. Consequently, KIL appealed in the Special Appellate Tribunal (SAT) against the impugned order and got it stayed. The trading on stock exchanges resumed from August 14, 2017 post the stay on order. KIL is furnishing all clarifications being sought by SEBI in this matter. Any negative verdict of investigation by SEBI in the above order against KIL will be a key monitorable. Get into the details of the negatives highlighted above. Hopefully I should be able to have all this up over the next 1/2 weeks. Disclosure: Took a very small tracking position, mainly to motivate myself to do the research. Hope to get differing opinions and insights. Not a SEBI Registered adviser. Do your own due diligence. It is likely that I may close out my position once I am done with the research and end up with any negative conclusions. Most of the Information is sourced from the DRHP of Shakun Polymers which had files papers for the IPO on May 2018. 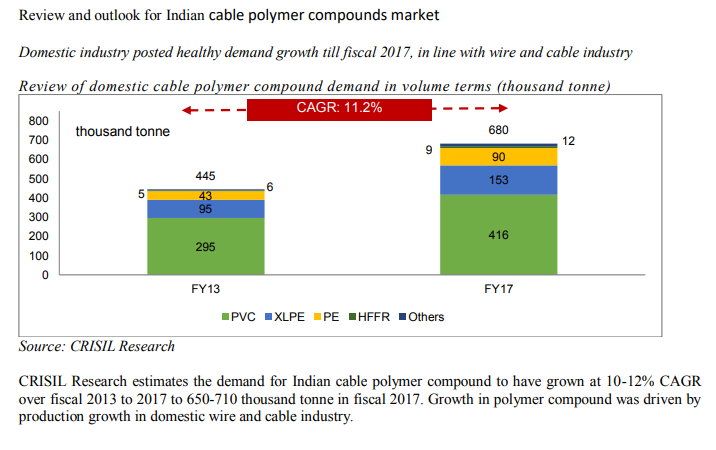 Around 30-35% of cable compounding is done in-house by cable manufacturers such as Polycab, Finolex, Havells, and RR Kabel. In-house compounding is higher for PVC compounds. 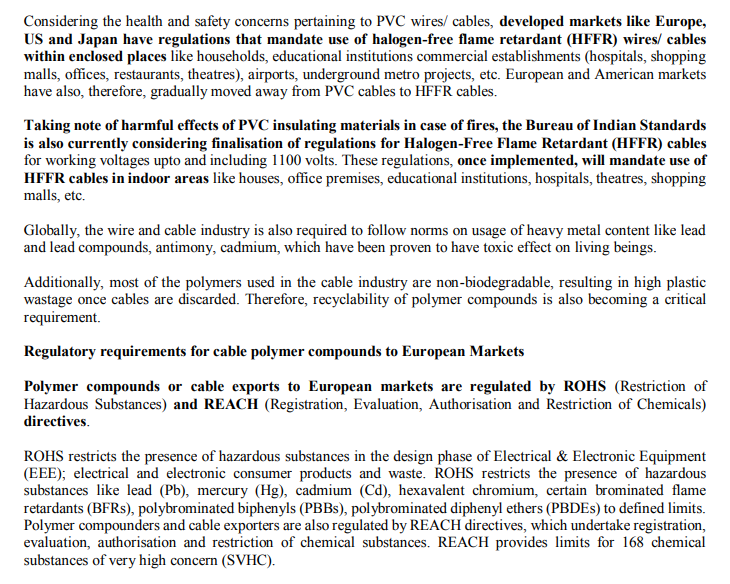 While specialized PVC compounds are outsourced to merchant compounders (independent polymer compounders), about 40-45% PVC compounds’ demand is for recycled compounds mostly used by unorganised players within building wires segment. 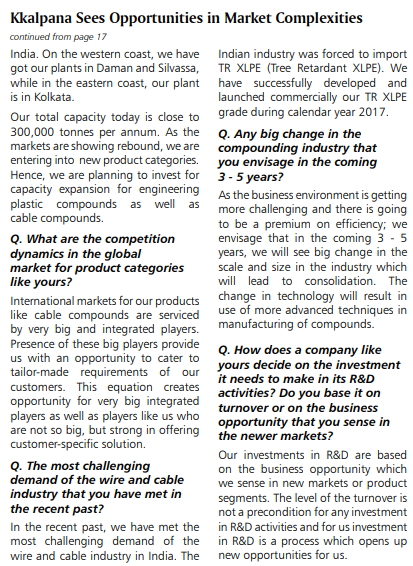 Large cable manufacturers have recently started in-house compounding of XLPE, although ~70% of demand is still met by merchant compounders. 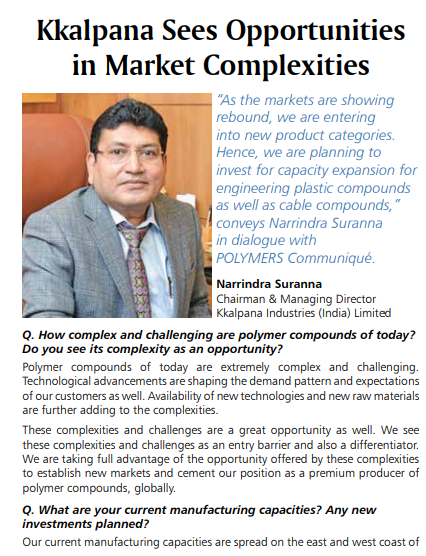 Kkalpana Industries, KLJ Polymers and Chemicals, and BLS Polymers are the top organised merchant compounders for PVC, XLPE, and PE compounds. 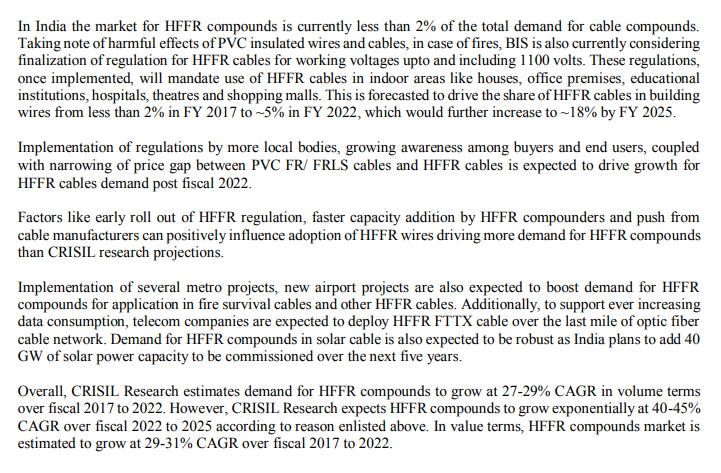 HFFR compounding market in India is catered by major players like Shakun Polymers, AEI polymers, Solvay. Shakun polymers is the leading manufacturer of HFFR compounds in India. The PVC compounding industry that comprises of large number of small players are focused on recycled as well as low value-added compounds, besides also focusing on the specialised PVC compound grades. 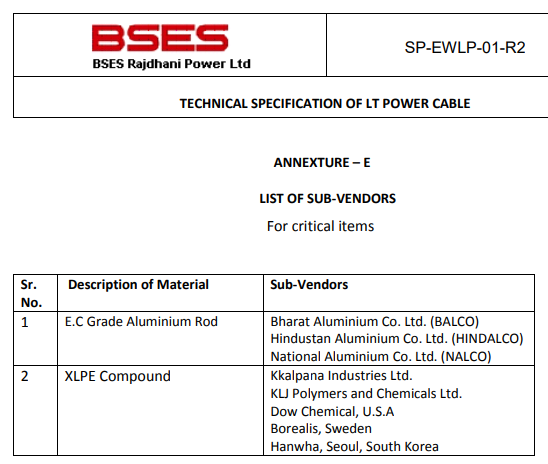 India is also dependent on imports of specialised compounds such as high voltage XLPE and HFFR grades. 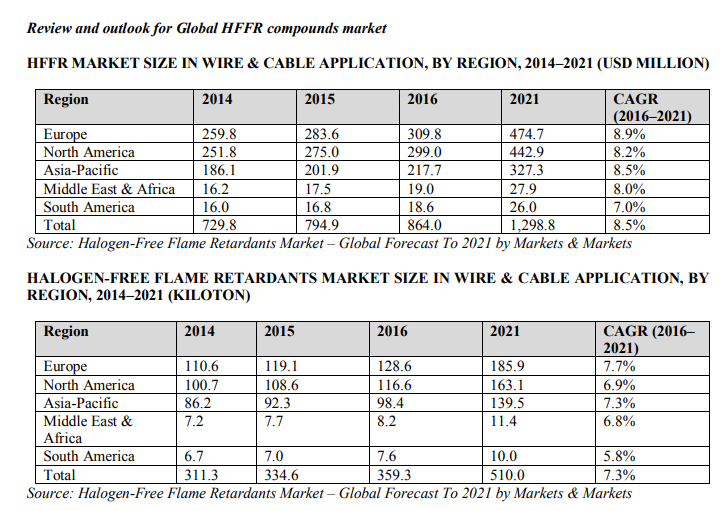 Overall, the cable polymer market is dominated by domestic merchant compounders. 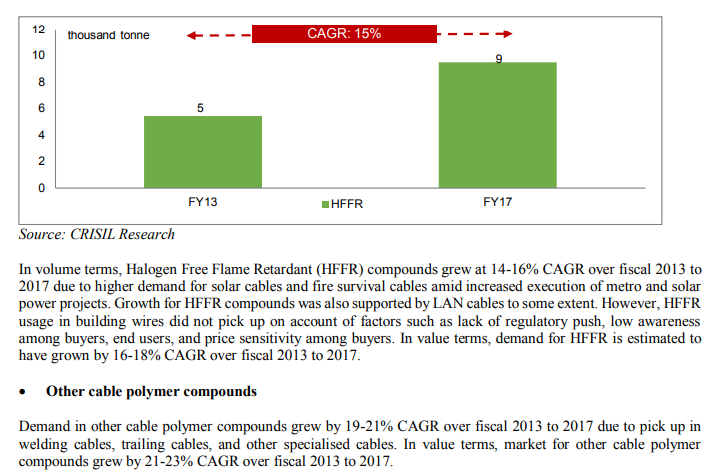 Foreign players such as SACO AEI Polymers, Solvay, Dow, and Lubrizol are focused on specialty grades that cater to domestic markets through imports. As can be seen above, there is overall addition and removal of debts at an order of magnitude difference to the eventual net debt levels. Is this a major red flag? or can we ignore it? Directorate General of Central Excise Intelligence (DGCEI) at Vapi arrested senior president of a plastic manufacturing unit for allegedly evading excise duty to the tune ofTax evasion: Rs 5 crore on Thursday. An official statement by DGCEI stated that Rajesh Kumar Kothari, president of Kolkata headquartered Kalpena Industries Limited, was arrested for alleged duty evasion and was presented before a local court on Friday. Official sources said Kalpena Industries, manufacturers of PVC compounds of various grades, has its manufacturing units in Silvassa and Daman. The company was found allegedly engaged in clandestine removal of excisable goods either through bogus bills or without billing. Apart from the above if any folks from Kolkata could provide any info about the reputation of the management? So far, the signals are mixed. Growth in Sales and Receivables in tandem. Last 3 years numbers are inconsistent. Highlighted cells for Installed Capacity are not actual but carry forwarded from previous years. Decent RoIC with high capital turnover indicating company’s focus on production advantage rather than pricing power with customers. FY18 Payables includes a significant portion of Acceptances. Leaving aside FY18, there is still a trend of better Working Capital Management. Comparing the CAGR of Working Capital with Net Block, indicates to me that company is capex intensive while working capital efficient. Clear demarcation of change in business fortunes around FY15. Better PAT to FCF conversion post FY15 and dovetails with the snapshot from my first post. Leaving aside that there is another discrepancy which indicates that the anomaly detected in the Indebtedness statements persists. Increase in Finance Costs while Reduction in both Long Term and Short Term borrowings. However, Working Capital numbers are improved. So, boiling down to the million dollar question: Do I invest or skip it? Mgmt does not seem to be top notch with mixed signals. Business is a processor type and does not stand out in terms of its quality or any specific competitive advantage. 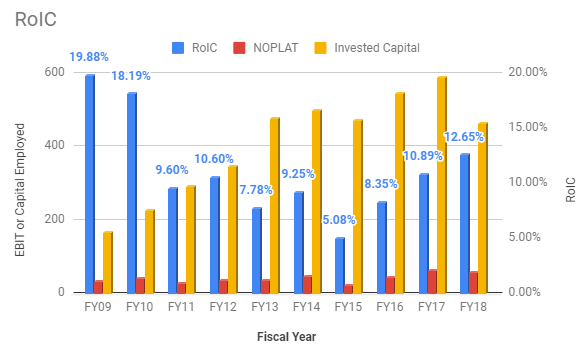 It does seem to be working capital efficient in a capex intensive industry and also being the largest player in it, may have some scale benefits. Improvement in debt to equity ratios could lead to increase in PAT assuming there are no strange increases in Finance costs as captured above. Conviction is low and thus does not warrant a major allocation. 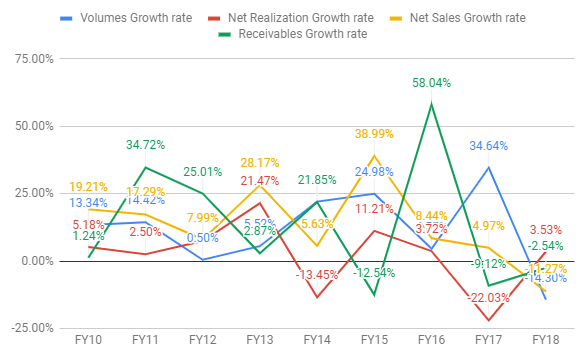 My crude valuation based on median realization and 2% sales cagr suggest an expected return of 10%. Sectoral tailwinds may fructify in the form of HFFR legislation and evacuation infrastructure for Renewables. I intend to allocate not more than 2% and track it for next 1-2 years if the turnaround since FY15 continues and improves the Cash Flow numbers. PS: My final post and hopefully there was some value addition.